As I approach my 10th year in business I am still learning about homes and perfecting my trade. 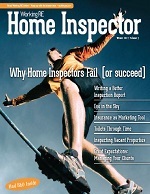 Our clients expect a perfect inspection that will catch 100 percent of the issues. However, few are willing to spend the time or money such an exhaustive inspection would require. Agents wouldn’t support it because a multi-day inspection would inconvenience sellers and buyers and likely nix the deal. Like all inspectors, I don’t like getting the phone call from an upset client about an issue they found in their newly purchased home that they feel I should have caught. Mike Holmes’s Show, “Holmes Inspection” doesn’t help either, as his favorite line seems to be, “The inspector should have caught that.” So the question remains, can we deliver a near-perfect inspection in the few hours we spend in a home? Standardization: a Big Mac is a Big Mac and a Boeing 737 built in 1968 can use parts from one built in 2010. The highest levels of quality possible: planes can’t fail and the food must be pure and taste the same regardless of location. A production process approach: different work cells combine to make the finished product. Quality processes throughout their systems: from suppliers to management oversight, checks are built into each process. Production systems which are reproducible and easy to teach to new employees. Lean production: steps are broken down and analyzed to get the most from each employee.